In the closing verses of the Old Testament, God spoke through the prophet Malachi to our time. He spoke across the ages to a generation living near the end of 6,000 years of history — 6,000 years, in which human beings have rejected God's ways, and have reaped the bitter fruit of their own way. The society they have built is based on a foundation of greed and selfishness. It is ruled by Satan, once an angel of light, now the adversary of God. It is become his world, and it is doomed to destruction. To this end-time generation, God would send a messenger, whose commission, like Elijah of ancient Israel, is to restore the truth in the midst of moral and religious confusion. But this generation is not the last to live in the end-time world. Children have been born to them, children whose destiny could be to live on into the World Tomorrow to become the foundation of the new society that will fill all the Earth. Against these children, Satan has waged a relentless and insidious war to destroy their potential and rob them of their destiny. The end-time world has become a dangerous place for children. The Worldwide Church of God, which sponsors this program, has a worldwide program for the training of the youth of its members. Today on this program, I would like to show you some excerpts from a film on the summer camps held by this church in all parts of the world, and I think you will find it an eye-opener. One-third of all people on Earth today are children under the age of 15. Most live in the poorer countries, condemned to a life of misery and squalor. One out of five of these children will die before they reach their first birthday. Those that survive may never get enough to eat, may never have clean, safe living conditions, will not receive even the minimum education or treatment that will leave millions of them physically and mentally maimed for life. In this world that has made such awesome progress, millions of children and teenagers still are forced to live in inhuman conditions without opportunity and without hope. While the world spends two billion dollars every week on war, every two seconds a child dies of hunger. In the developed world, physical living conditions are better. Improved sanitation and medical facilities have greatly increased the children's chances of growing up. But the children of the richer world must face other serious problems, for Satan has flooded their world also, with cruel deception and lies. In the midst of affluence, these children face moral and spiritual poverty, as Satan uses every evil device to undermine marriage, education, to pervert culture, and discredit what remains of the true values. Children become ever more frustrated and confused. They become alcoholics or hopeless drug addicts. They're drawn to bizarre and perverted entertainment, and many are driven to suicide. In despair and frustration, children and parents have begun to lose contact and turn away from each other. The family, the basic building block of civilization, has begun to crumble. And so, as the human race stands on the threshold of the World Tomorrow, God, through the prophet Malachi, gave one more commission to his end-time servant. "And he shall turn the heart of the fathers to the children, and the heart of the children to their fathers, lest I come and smite the Earth with a curse." To help families meet the challenge, and to help bridge the gap that has opened up between parents and children, the Worldwide Church of God is developing a comprehensive youth educational program. 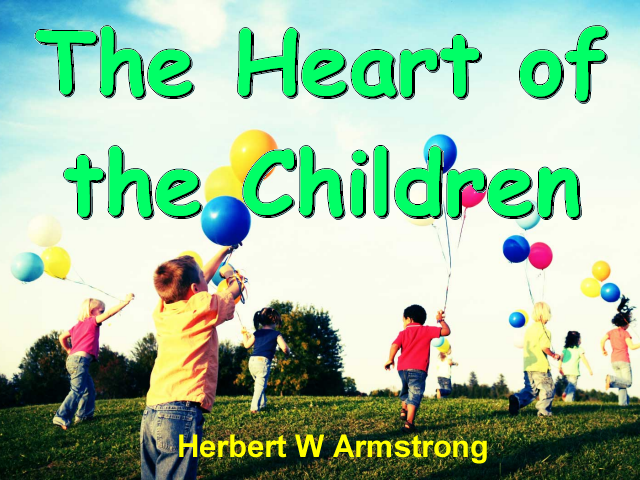 This program, directed by Pastor General Herbert W. Armstrong, is designed to support the parents in teaching their children, and to provide positive educational and recreational opportunities for the youth of the church. Youth '84, soon to be in its 5th year of publication, is written to help teenagers deal with the problems and pressures unique to their generation. Its lively, colorful pages show its readers how to live carefully in this world, while preparing for the future that God has waiting for them. Through the Youth Educational Services, the church has developed a multi-level correspondence course for children between the ages of 5 and 13. The Y.E.S. course gives parents a helpful tool to teach their children the basic principles of God's plan, so that they can start out their lives on the right foundation. The individual lessons of the Y.E.S. course are written by senior ministers and experienced teachers. Y.O.U., Youth Opportunities United, is the Worldwide Church of God's international program for teenagers. Through many varied activities, Y.O.U. gives older children educational, social, and recreational opportunities within the framework of the church. Every summer, hundreds of teenagers have the opportunity to attend one of the summer educational programs that are held in many locations around the world. Young people from all backgrounds come together for three weeks of challenging activities and fun. But it is fun with a purpose. The church's main campsite is located on the shores of Pelican Lake, near Orr, Minnesota. In the 20 years of this camp's existence, much valuable experience has been gained in training, teaching, and encouraging teenagers. For many, the three weeks of summer camp has been a turning point in their lives. Mr. Armstrong is a frequent visitor to the campsite at Orr. The summer camp is first and foremost a place of education, and Mr. Armstrong has long taught that education should be conducted in an atmosphere of quality. He makes a point of personally inspecting all new facilities. He also believes the Summer Educational Program should offer ample opportunities for both education and fun. A summer camp program allows teenagers to experience the thrill of ultramodern sports. Others can enjoy more down-to-earth recreation. Summer camp is fun, but behind the fun, there is a serious purpose. Yes, they come here and have fun. But the thing is, they get a new definition of fun. Some children have come to these camps, that have been trying to get fun out of drugs, smoking marijuana, and then even worse things. They learn that that's no fun, and that it's only harming and damaging them. But they learn things here, and skills that really are fun, and that are enjoyable. Now, we're trying to teach children at these camps, some of the better things of life that are worth more than just money: doing, giving, helping. They learn character here; they learn discipline. This is, in three weeks the transformation that is made in the lives of these children is unbelievable. Many of the campers at Big Sandy have attended camp at Orr in previous years. The facilities at Big Sandy give them the chance to have new experiences, and to develop new skills as they respond to the direction and guidance of their instructors. Big Sandy is unique. Since the campers have had previous experience, they are a little older and little more responsible. They come to Big Sandy having better attitudes, having built a little better character, having more self-discipline, and better respect for God's laws and for man's laws. The facilities at Ambassador College in Big Sandy are being put to good use during the summer months, in that hundreds of young people are getting a chance and an opportunity to see the campus and to be instructed by the college faculty. It also gives them a chance to see that Mr. Armstrong is not only concerned about their first camp experience, but that he is concerned about their future as well. Now I have tried to tell you what's the purpose of the church I've tried to tell you what's the purpose of human life and why God had people created. I've tried to tell you something about who and what God is. Now I hope it makes sense to you, and I hope you can take these things home with you. Now just remember, you're no better than other kids, but you're learning things they haven't had a chance to learn yet. And you try to live these things when you get home. It means there's a bigger responsibility on you to live God's way, and others don't know how to live that way yet. But there's a big responsibility on you to do it, and you'll be so much happier if you do. The summer education program for Britain is held on the banks of Loch Lomond in southwest Scotland. Campers from several nations enjoy a variety of exciting activities during the three-week program. When I first went to S.E.P. 16 years ago, for me, it was the fulfillment of a lifelong dream, because I was given the opportunity to do many things I never thought I would be able to do, things which in Britain were just not available, or were simply too expensive for the average person. Today, that is still the case. It's a real thrill to see teenagers involved in exciting activities they've never experienced before, and would not experience apart from S.E.P. But perhaps the greatest satisfaction to me is to hear from parents after S.E.P., describing the positive effect camp has had on their teenagers. Many are enthused and inspired, and filled with a sense of accomplishment, and simply can't wait to come back the following year. The summer camp in New Zealand is a very beautiful facility on an isolated island which is accessible only by boat, and from there, it is another 15 or 20 minutes by vehicle to the actual campsite. This part of New Zealand is still unspoiled. It's almost like entering a new world. The campers are asked not to bring radios, which helps create a very serene and idyllic atmosphere. It's about as close to a millennial setting as I've experienced. The churches in New Zealand are quite small and far apart, but at the S.E.P., the Y.O.U. members from all over the country can get together and also meet many other young people from all over our South Pacific region. Across the Tasman Sea, the Australian S.E.P. is in full swing. A permanent campsite is being developed at Moogerah, in South-East Queensland. Although Australia is a large continent, most people live in the cities. The S.E.P. camps give the Y.O.U. members a chance to meet with other young people from all over the country. Activities like riflery, horseback riding, and water-skiing give the campers a taste of the outdoors, and a chance to work together in challenging situations. They might have to persevere while learning to ski behind the screen of a high-powered boat, or perhaps concentrate while keeping their balance as they do a headstand on the water. Maybe it's enjoying the tranquility and sense of achievement, or running before the breeze while windsurfing. Some campers try their hand at golf, or learn a handicraft, while others go to the rugged cliffs near Lake Moogerah to learn rock-climbing. Rock-climbing is an exciting sport. Once you've learned the proper techniques and pay careful attention to the rules, it teaches courage, coordination, and attention to detail, lessons that once learned pay rich dividends in less precarious aspects of life. "What is the eighth commandment? Okay, you shall not steal. Let's turn to Ephesians 4, verse 28. Ephesians chapter 4, verse 28. While we're turning there, let me ask you: when does a thief cease to be a thief? Okay. It's not just a matter of when he stops stealing, that's just a thief between jobs, more or less. A thief ceases to be a thief when he ceases thieving, and then repents. It's not just a case of stopping the act. It's turning around and replacing it with something good, driving out the evil with something that is good. So in Ephesians 4:28, we find here that a thief ceases to be a thief when he becomes generous, when he begins to give, to practice the way of give rather than taking from other people." Now, you've been tested on certain things here — tight-rope walking, and some of the things that you've done, and mountain climbing. Some things have tried your nerves, see if you've got the nerve to do it. And you'll be tried to see if you've got the nerve to stand up for what you learned here when you get home. You see about it, and just pray to God and ask him to help you, and he will. Believe me, he will if you pray and ask him. So remember you found a better way of living. Don't ever lose it, don't ever forget it. Just keep it, and keep it forever. In the French province of Lorraine, near the little town of Marange, 80 children and teenagers from several European countries enjoy a summer education program French-style. [singing] The beautiful countryside of Lorraine is a sobering reminder of the need to prepare for a different world, for in these green fields on the border of France and Germany, Europe's great armies have clashed across the centuries. The Kaiser drilled and paraded his troops here, then he led them into war, and a generation of young men were slaughtered. After the first World War, the territory was given to France. The French built a formidable barrier, the Maginot Line, to protect their frontiers against the enemy, but to no avail. Adolf Hitler promised his people a thousand years of national greatness, as he taught the children the arts of war, and sent them to fight his battles. The Nazi legions devastated Europe for four and a half terrible years, before they were pushed back and destroyed by the combined armies of the wartime Allies. Only a few miles from the campsite at Marange, is the war cemetery of Saint-Avold. Thousands of American soldiers are buried here. Most were young men, little more than teenagers, victims of a world that did not know the way of peace. It is sobering for the young Y.O.U. members to visit this cemetery. No greater contrast could be drawn between the ways of a world held captive by Satan, and the way of life that comes from God. Satan's world has brought 6,000 years of misery and death. God offers life, abundant life in the World Tomorrow, where no one will live in fear and no nation will ever have to send its young men off to war again. One great conflict still lies ahead for the human race — a war in which terrible weapons will be used. So great will be this war, so devastating the power that will be unleashed, that unless God intervenes, no flesh would be saved alive. But God will intervene and bring the dazed survivors into the World Tomorrow to begin a new way of life. What kind of world will they inherit? Once lush farmlands will have become barren wastelands. Forests will be destroyed. Transportation links will be in ruins, and communication networks shattered. Lakes and rivers will be polluted. Food will be in short supply, and the air may be polluted from the dust and debris of nuclear war. There will be millions of widows and orphans in need of help, wounded in need of healing. This world's great cities will lie in ruins, and their industries destroyed. The rubble must be cleared and the waste places rebuilt, into sparkling, clean cities that are exciting to visit and a pleasure to live in. And so, a new society will fill the Earth. It will at last be a world that is safe for children. We are on the threshold of a new world, when the knowledge of God's way of peace will cover the Earth as the seas cover the ocean beds. Parents and children that work together now will be the ones who are ready to teach in the World Tomorrow. "He shall turn the hearts of the fathers to the children, and the children to their fathers." That is the challenge facing God's people today, the first families to inherit eternity. Now I have a most intriguing booklet for you on The Wonderful World Tomorrow — What It Will Be Like. What is it going to be like in the world you're going to live into — The World Tomorrow. It's coming very certainly, and very soon. So I'd like to send you this booklet — The Wonderful World Tomorrow — What It Will Be Like. There's no cost, no charge, no obligation, and no request for contributions of money. Now also, I would like to send for the youth who might be listening in: Youth '84. It's a wonderful magazine for teenagers, for those that are young and have been young, and remain young, and it's one that thousands of young people are reading all around the world already. Now I'll give you a one year's free subscription, no subscription price. You just send me your request: Herbert W. Armstrong, Pasadena, California. That's all the address you need. Herbert W. Armstrong, Pasadena, California, 91123. Or, just go to the telephone and call 800-423-4444. You dial 800-423-4444. So until next time, Herbert W. Armstrong. Goodbye, friends.